Reading Every Heart a Doorway is like coming home. I think that most of us are familiar with the concept of a portal fantasy, even if the term itself may be new to some. Think of The Chronicles of Narnia. Think of The Wizard of Oz. Think of all of those stories you've read, all of the you've dreamed in your childhood where you are transported from your normal, boring, mundane, possibly painful life and transported to some magical realm where you fit in so much better. A magical world where you can have some sort of adventure, where you mattered. A magical world that matched your imagination. Now, think about what happens when you get back. You've had this fantastic magical adventure and now you are back in the "real" world that perhaps will never feel like home again (if it ever did) and your parents don't know where you've been and why you just won't tell the truth and they just don't know what to do anymore. What happens next when you can't just "adjust"? 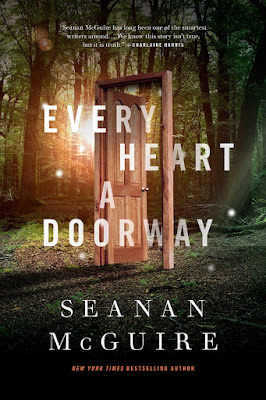 That is the question Seanan McGuire begins to answer in Every Heart a Doorway, a beautiful story about what happens when children return home from their magical adventures in worlds they just can't return to. Some of them end up in Eleanor West's Home for Wayward Children. Children like Nancy, a girl who visited an Underworld where absolute stillness is prized. Her parents, like the parents of the other children at Eleanor West's, are as unable to cope with how their children came back as their children are unable to accept being back in the "real" world. Readers learn, as Nancy does, about the variety of worlds the children came from and get the terminology used to describe them: Nonsense, High Logic, Wicked, Virtuous, etc. The type of worlds the children visited were deeply personal to who they were and what they so desperately needed to escape into. Successful fiction works in a number of different ways, perhaps as many different ways as their are portal worlds for these children to disappear into. Some stories are more intellectual, requiring the reader to really think and work through some problem. Others are the literary equivalent of a mindless action movie you read while munching on popcorn. Some are silly, some are funny, some are clever, some, like Every Heart a Doorway, are like coming home again to a story you didn't realize you lost. Every Heart a Doorway makes you feel. Perhaps moreso than any other book I am likely to read this year, my emotional response to Every Heart a Doorway has everything to do with who I am now and who I was when I was a teenager. I wish this is a story I could have discovered when I was twelve. I love this book with a warm and full heart as an adult, but I would have lived in Every Heart a Doorway as a child. I would have made friends with these children even though their experiences were so alien to mine. I can't imagine that I would have noticed that Nancy is asexual and that Kale is trans, or that I would have understood either concept. That part of the story wasn't for the child I was, but each of those elements are very much for other kids who would never see who they were in a story like this one. It matters that it doesn't matter for the story, if that makes sense. If I have any quibble with Every Heart a Doorway, it is only with the last couple of pages and even then, it depends on the lens with which I view the book. The way McGuire set up of the novel, I'm not sure the ending was truly earned in such a relatively short period of time. On the other hand, it did fit the emotional journey of the novel and the more invested I am in the novel, the more it works. Overall, this is a very small quibble. Every Heart a Doorway is a beautiful and heart wrenching story of kids who don't belong anywhere except perhaps the one place they can't get back to. By no means have I read everything Seanan McGuire has written, but this has to be her best work. It is damn near perfect in all of the ways that matter to me and to my heart. Nerd Coefficient: 10/10 "mind-blowing/life-changing." See more about our scoring system here.